Wowza. Has it been busy, or WHAT? 2010 has been the official launch of Blush Design Studio, and I've never been so hard at work! And you all want to know something: I wouldn't change a thing!! I must admit, I have been holding back posting some of the orders due to 'shoddy camera' syndrome whereby my little point and shoot camera has taken a backseat to my endeavours and refused to come out during pit stops. It's not fair. I'm eyeing a new digital slr, however, so I suspect the photos will become THAT much more incredible very very soon! Because really, everything looks better with an slr. Everything. 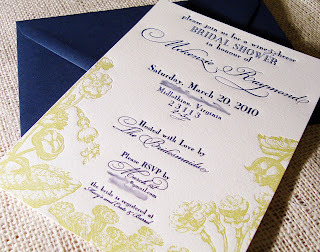 Today, I HAVE to show you the most beautiful bridal shower invitations I have ever seen. I know- I'm biased- but I also happen to be a firm lover of florals, and these are held in my highest regard these days. One of my best friends came to me and asked me to create 'something' for her roommates' upcoming bridal shower. Now, something takes on several meanings, and I think I went through a few iterations in my head before deciding that florals may be the way to go, and it certainly was no easy task. 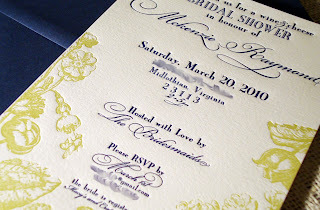 We talked about damasks, digital print, I may have even mentioned stripes-- in the end, florals and letterpress won. 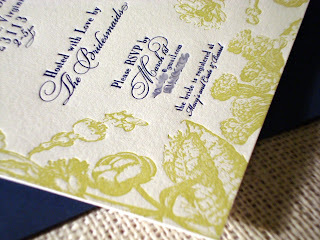 I designed this invitation based on an invitation suite I whipped for my good friend, Liz and her summer garden-party-tent-wedding (more to come!). These took on a slightly 'lighter' feel in their chartreuse green-- and who doesn't love that little bee hanging out to the left. We'll call him Jasper. Jasper was about to be erased from the final print, but in the end, his adorable little self won out, and was included in the design. I couldn't help it. The bride? Adorable herself. Mckenzie is one of those spirits of this world that I am pleased to say I've met and thoroughly enjoyed. She will keep you laughing until you need to walk away to ease your muscles and comes up with the most ridiculous- yet intuitive- scenarios in conversation. She will be married to her love of her life sometime this summer, and I'm so excited to be apart of her wedding memories. Thank you girls, and Congrats, MCK!